Luke passed his Basic Obedience class without a problem. He was the youngest in his class at 6 months old and even though he wasn’t perfect, he did quite well. He’s always seemed to be a quick learner – I taught him to lie down in about five minutes in our kitchen, before they even worked on that in school. Once he graduated, we decided to take a couple of months off before taking the next step. We weren’t sure that we wanted to take him to the same school because their class times for the next level weren’t the best for our schedule. When my hubby and I took a “staycation” over the summer, we went out for a drive one day and to run some errands. We passed a place that I had seen when researching obedience schools on line, but it was a little further from our house than we wanted to travel for school. After traveling a few more miles to the next town, we saw that this same school, White Mountain College for Pets, had another location that was a few miles closer to our home. We stopped to talk to the owner, and liked what we saw and heard. We decided to sign Luke up for three private lessons. The main reason we did this was because I am a shy introvert and I don’t like going to classes where there are many people there watching what I’m doing. My hubby had taken Luke to basic obedience, but we weren’t good about following up on what he had learned at home, so I knew I really needed to go myself. We are lucky that we could afford the extra expense. As it turned out, I feel like we got so much more for our money with the private attention that it was definitely worth it. I had been concerned with the fact that Luke had growled at some other dogs at our vet’s office (one was acting up but the other wasn’t) and that he was barking at people coming to our house. We learned a few days after signing up for classes that we needed it even more than we thought. I will tell you more about that in my next post in this series. This school will send their trainers to your home, but we opted to do it at their location. However, some wires got crossed and there was miscommunication, and the trainer ended up being 45 minutes late for our first appointment! We were in touch with the owner so knew what was going on though, so we waited. Not only did we go past our allotted one hour session that night, and most other nights, after our third session they offered us another one free of charge to make up for that mishap, which we thought was great. Luke with his (our) trainer Dave. We liked the trainer Dave immediately. The first session involved a lot of talking about Luke to see what it was we were looking for. Dave is great, he tells a lot of stories, but they always pertain to the subject at hand. He is former military, currently a police chief in a small NH town, and he has trained service, police, military, and every day dogs. He will be retiring from the police force to train dogs full time. I had been reading a lot about clicker training and was interested in trying it, and he was excited that we wanted to. He ran through some basics to see if he thought Luke would be responsive to clicker training. There was a little bit of an issue with the clicking noise making Luke nervous, so we initially had to muffle it a bit (in time he got over that). You start out by just having treats in hand and clicking and treating any desired behaviors. Luke responded well to it, and we could all see him trying to figure out what it was we wanted. He quickly started sitting to get a click and treat, and then lying down. We left that first class feeling very optimistic. Luke has learned to go to his bed when told to. Our homework was for my hubby and me to each work on the basics with Luke for 10 minutes per day, to cut it shorter if it didn’t go well, and to always end on a positive note. We had a bad week. Luke wasn’t responding well to us at home. All the optimism was gone, and we were feeling frustrated by the time we went back for our second class. Dave was surprised, so we worked some more with Luke, and by the end of that second session, Dave still felt like this training would work for Luke. The conclusion we came to was that the treats we were using were not high value enough. In our first class, we had some freeze dried liver treats and Luke loved those. But we had run out of them and used something else, which probably wasn’t as attractive to him. Dave suggested other things to try, I bought some more freeze dried treats, and from there on out things went much better. Luke might even have a thing or two to teach his older sisters now! For this first post in my series I want to leave with these thoughts and advice based on our experience. I’m not an expert – you should always consult a trainer for expert advice. If you are thinking of trying clicker training with your dog, I highly recommend it! I’m so happy we decided to take this route with Luke. If you can afford private lessons, do it! 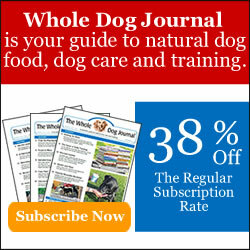 It is well worth the extra money, especially if your dog has special needs. Don’t give up, even if things don’t go well initially! Don’t underestimate the value of the treats you use. We now mix things up….some higher value and some lower value. We learned that the anticipation of what treat might come next can motivate your dog. Next Thursday, November 13th, is our WOOF (Working Out Our Fears) Support quarterly blog hop, and that is going to tie in well with this series I plan to write about our experiences with clicker training. If you have a story to tell about your fearful or reactive dog, please join us! This hop’s theme is “Hopes and Challenges This Holiday”. Will the upcoming holidays be a challenging or hopeful time for you and your reactive dog? Maybe it will be a little bit of both. We are excited that we will be having a giveaway for this hop as well! One winner will receive a Training Package that includes a Clicker, a Treat Pouch & a Lickety Stik dog training treat courtesy of PetSafe. We hope that you will join us and our co-host Oz the Terrier. The hop code will be open from 12:01 AM on Thursday, November 13 through 11:59 PM on Sunday, November 16 on both host blogs. Everyone is welcome to join the hop and/or the discussion on each post. You do not have to enter a blog post in the hop to participate in the giveaway, however, you will need to comment on one of the host blog posts to qualify. See you there! Training is good for a dog’s mind and body, and helps their overall fitness. We’re happy to be joining the FitDog Friday blog hop. Thank you to our blog hop hosts SlimDoggy, To Dog With Love and MyGBGVLife. Please visit their sites and others through the links below to learn more about keeping your dogs fit and happy! It’s fun to train together! I taught my bipeds to mix the treats up. It pays to keep them on their toes! It really is fun! I think it helps us to bond with Luke too. It’s my first time doing any kind of formal dog training, so it’s a good experience. It’s definitely not for everyone though. I love private lessons too. We also use a variety of treats to keep things interesting. Though I think Rocco will work for anything he can eat. He LOVES frozen green beans as well as his meaty treats too. Since Luke also loves fruits and veggies, I might have to try that with him….especially the green beans. I need to think about making some homemade treats too I think. I might have been spoiled by the private lessons, so I hope our financial situation stays good if we want to do more in the future! I love clicker training. I’m actually going to Clicker Expo next year which I’m excited about. Mr. N will not work for typical low value treats period (vegetables, fruits, kibble etc.). When we’re working in high distraction environments, he gets low fat cheese, freeze dried meat and liver. Ooh, there’s a Clicker Expo? Now that sounds interesting! I haven’t tried fruits with Luke yet….he loves bananas and they might work. But that would be kind of messy. Cheese has been good too though. We know everyone is into clickers and it is great they work so well, but Mom has no time or patience for using one. We have one, but it is just another thing to carry around. That is awesome that it works so well with Luke! We also agree on mixing up the rewards. We do that with our nose work and tracking. Sometimes it is something crazy good like hotdogs and other times freeze dried treats, other times just a Zukes mini. It keeps us guessing and working hard to get that reward. Thanks for joining the hop. I am sure that clicker training is not for everyone…person or dog. I’ve tried some with Cricket and I’m not sure it’s going to work with her. But even if Luke is the only one we use it with, it will be worth learning. I still keep trying different treats with Luke, trying to hit on the ones that really get his attention. I imagine I’d be fine once I got into a group class, but with me it would be getting myself there that would be challenging. I just know how I am and I’d make excuses not to go. Oh yes, the coordination part is the most challenging. I actually found a clicker that will connect to a leash, but I haven’t tried it yet. I think any tool that helps is great, even if you only use it a little bit, or for certain situations. Back when I only had one husky, I clicker trained her. (Mika) And I loved it, it worked well. But once I got the other two, it became really hard tot ry and use the clicker for all of them. And there was no way I could walk 3 dogs at a time and click while i’m at it. I do miss it though. I am interested to hear more about Luke growling at other dogs in the vet office. My boy Koda is the friendliest dog you’d ever meet, but he has growled once or twice as well, and barks at the door too. So I can’t wait to read more on this! Thank you, Jenna. We are definitely challenged with how to use this for the girls as well. My hubby has worked with Luke and Cricket together with some success, but it definitely seems much easier to work with them alone. Now you have find time to work with each dog, and it’s hard enough just being consistent with one! I’m glad to hear that you are looking forward to my future posts as well….since I have a lot more to say on the subject! 5-10-minute sessions. Geez I hate auto-correct! Don’t we all (hate auto correct) – LOL! Clicker training does require coordination and I don’t have a lot of it. So if I can do it, I think anyone can! The worst was when we got to loose leash walking, I’ll be telling more about that in future posts. We’ve also tried it a bit with the girls, and it hasn’t gone as well, so I can’t say that it works with every dog anyway. The girls do OK, but they could also use a little reinforcing of even the basic commands. Interesting to read about your training experience. I agree having the time and money to afford private training is great – we were lucky to be able to do it with Jack and Maggie and I know it has made a big difference in both of them Can’t wait to read more. I thought I was going to write about it in one post, but I quickly realized I had a lot more to share about, and would need to do a series. I’m excited about it though and glad to hear it is interesting to others as well! Private lessons are wonderful. We love when we have a chance to take them with our trainer. I can totally relate about the treats not being high value enough. When I was taking Storm trough obedience class, she was pretty unfocused. The instructor suggested that I get the treats that smelled really yummy to help get, and hold her attention. Worked like a charm! Congrats to you, hubby and Luke on a great job! Thank you! Now that we’ve done private lessons, I don’t think I’d ever want to do it any other way, except for maybe if we decide to take him for agility training down the road. I’m glad to hear it’s not just Luke as far as the treats go too. Don’t give up is the best tip! It was so good of you to recognize you needed to do more training with Luke and that you sought out private lessons. I wish more people would take the time and expense to do that maybe we would have far less dogs in the shelter. You guys will get there and it will be so worth it in the end. Keep up the great work! Thank you for the encouragement! There are still times I get frustrated, especially with what we’re working on right now (going to his bed when people come to the door). Training requires a lot of persistence and patience, I think, and neither my hubby nor I have a lot of that. But I do have determination and that’s what will keep me going!